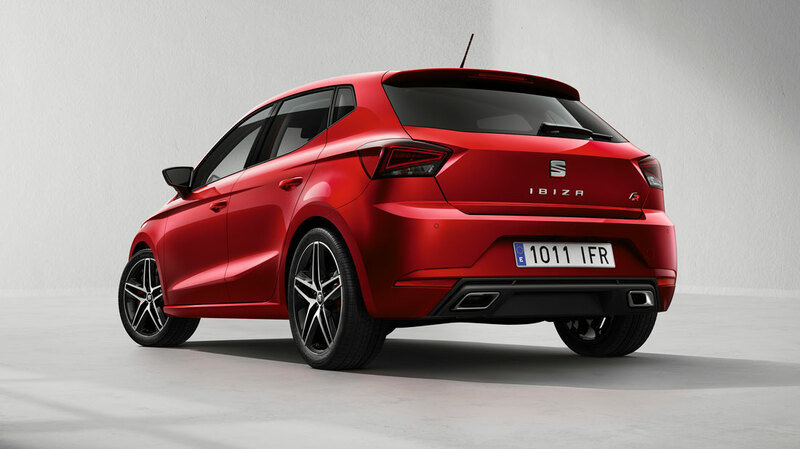 Seat has unveiled the new Ibiza, fifth generation of its iconic model, strong of a 33-year history and 5.4 million units built. The first Ibiza, launched on the market in 1984, was penned by Giorgetto Giugiaro. Other designer after him, like Walter de Silva and Luc Donckerwolke, led the project of the following generations, up to this new one designed by Seat design team under the direction of Alejandro Mesonero. “We defined this new Ibiza with an eye to the tradition with the four former generations, and one eye to the future of the brand”, said Mesonero unveiling the car. Built on the modular platform MQB A0, it had to be fresh and young, and yet mature and balanced too, pushing the evolution of Seat’s design DNA. lbiza has impressively increased its interior roominess. lt is much wider by a 87 mm, it is two mm shorter and one lower than the previous model, with increased wheelbase and tracks. At the front of the car, the triangular full LED headlights and the iconic daylight graphics make the new Ibiza instantly recognizable. The badge displayed on the grille is enhanced by the two characteristic lines on the bonnet, with a slight gap in the chrome frame. The x-shaped design gives great dynamism and visual stability. The longer wheelbase and window graphics accentuate the size of the new lbiza, while the double blisters down the length of the body are typically Seat, giving the car a more expressive, three-dimensional look. The bodywork has been beautifully sculpted, combining sharp lines and smooth surfaces. The rear of the car is also typical of the lbiza. lts rear lights wrap around the car, interacting with the blisters at the rear, properly proportioned within a unique design and offering fantastic aerodynamic performance. The boot’s strong lines and bumpers make the car appear wide and with an almost monolithic look, while the rear reflectors appear to bring the car closer to the ground. In terms of the interior, the same design steps have been followed that are now in the Leon and Ateca, but this time with a new vision for its design language. More tension, more technical and precise lines and lighter proportions have all been added in order to achieve a more elegant look and a greater level of perceived quality, while new materials have managed to safeguard its youthful and dynamic character. Ali of the controls and instruments are situated around the driver in the highest position possible to avoid the driver having to take his or her eyes off the road. Just as with the new Leon and Ateca, the start button is in the same place, to the left of the gearbox. In many details the new Ibiza is close models in higher categories, without forgetting of course the onboard technology, such as the 8-inch touchscreen and the Full Link connectivity system. A must-have for younger customers, those who Seat is targeting with its car and with the Ibiza in particular. 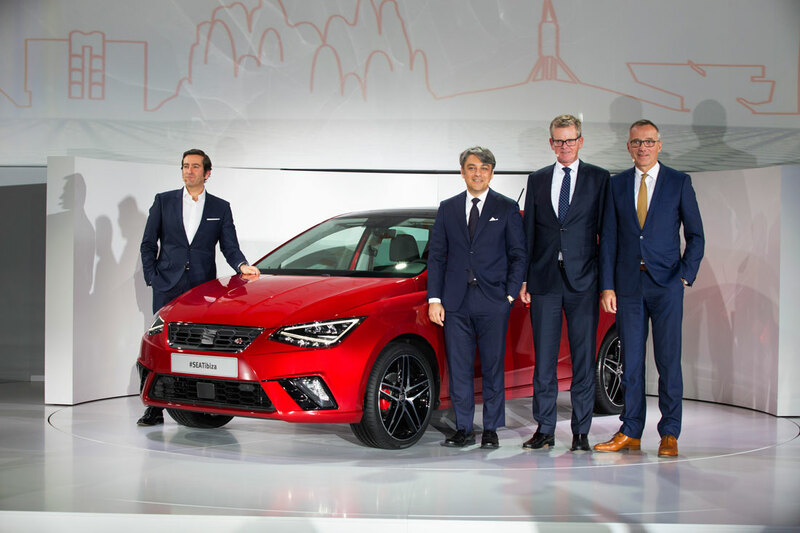 Alejandro Mesonero, Director of Design Seat; Luca de Meo, President of Seat; Dr. Matthias Rabe, Seat Vice-president for R&D; Dr. Andreas Tostmann, Seat Vice-president for production, during the presentation of the new Seat Ibiza in La Cúpula de las Arenas de Barcelona.